Can you please offer help for the PRTG setup wizard Trial License or Starter Edition Key screen? Where do I get a license key? 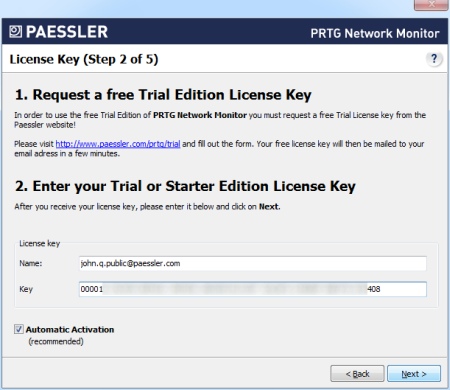 In order to run a PRTG trial, you need a trial license key. Please register at Paessler to obtain a key for free and enter the license key information into the respective fields. If you have already received a Trial License or Starter Edition key, you can skip this step. Please visit the Paessler trial website at http://www.paessler.com/prtg/trial and fill out the form. You will receive a free license key via email within minutes. You can enter either a Trial License or a Starter Edition key here.